This Kichler Taulbee 15 light large cartwheel chandelier in weathered zinc finish with wood veneer and rustic charm features ceiling mount and chain suspension attached to the two-tiered frame by a large top eye. Two cartwheel frames in weathered grey wood veneer are suspended by iron rods with twisted metalwork detail. Scrolled ironwork sits inside the cartwheels, with ten weathered zinc candle style lights on the lower tier and five on the top, featuring metal candle pans and matching candle tubes. The Lodge inspired style of this 15 light large scale two-tier chandelier features an elegant, timeless design, with weathered zinc metalwork and grey wood veneer. 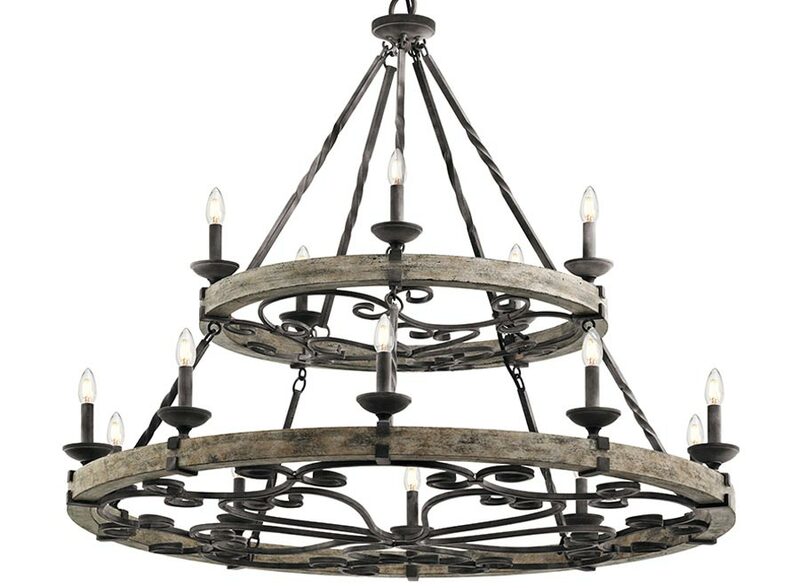 A high quality ceiling light that looks at home in traditional, rustic or Gothic styles and perfect for a large living room, dining room or hallway. Supplied with 183cm of chain that can be shortened at the time of installation to suit your ceiling height. Please see the technical information below for minimum and maximum drop. There are coordinated fittings available in the weathered zinc finish Taulbee collection that can be viewed by scrolling down this page. Please note: This is a large chandelier that requires plenty of space and ceiling height. Please ensure that it is suitable for your installation prior to purchase. Supplied by Elstead Lighting and designed in the USA by Kichler, founded in Cleveland Ohio in 1938. L.D. Kichler & Co. 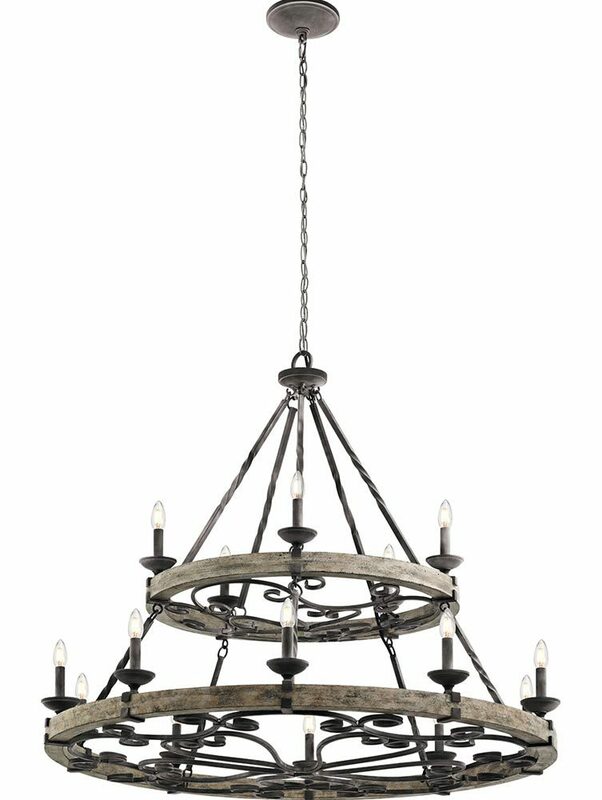 They are held in high regard for their diversity of design and breadth of range, which includes some truly striking contemporary and substantial light fittings, such as the Taulbee 15 light large cartwheel chandelier in weathered zinc finish with wood veneer and rustic charm you see here.